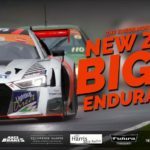 Porsche ace Matt Whittaker won the opening one-hour race of the ENEOS North Island Endurance Series in his last-gen Porsche 991, overcoming a solid challenge from Nick Chester's monster Holden Commodore VX to take honours in the first round of this year's championship at the Bruce McLaren Motorsport Park, Taupo. 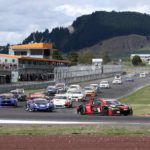 It was advantage Chester in qualifying with the iconic Holden..
ENEOS NIES THREE HOUR RACE It was a case of two wins from two races for International Motorsport after the team secured back-to-back wins in the ENEOS North Island Endurance Series season opener. After an impressive performance by Matt Whittaker in the morning's ENEOS One Hour encounter, a dominant performance by Jonny Reid and Neil Foster in their Audi R8..
First race of the weekend for the SAS Autoparts MSC NZ F5000 Tasman Cup Revival Series at the Taupo Historic Grand Prix meeting at Bruce McLaren Motorsport Park today and pole man Ken Smith (Lola T332) continued on his winning way despite intense competition from fellow front row starter Michael Collins (McRae GM1) and fast-finishing UK-based series regular Greg Thornton.. 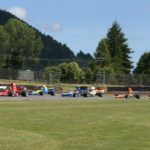 This weekend’s Taupō Historic GP motor racing meeting at Bruce McLaren Motorsport Park will see New Zealand’s world-leading Formula 5000 Association continue the good work its members have been doing for the past year here, across the Tasman and in the United States celebrating the 50th anniversary season of their iconic stock-block V8 single-seater category. 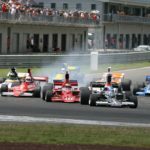 The popular Historic GP meeting..